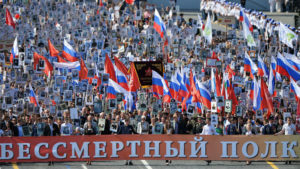 One of the West’s top points in condemning Vladimir Putin’s “regime” since 2007 has been his alleged suppression of democratic institutions, including an assault on media freedom and imposition of government-directed propaganda. This week, the accusation was repeated in a resolution of the European Parliament calling for stronger counter-measures in defense of European values against “information warfare” from Moscow. The charges — that Russian media are only an instrument of state propaganda directed at the domestic population to keep Russian citizens in line and at foreign audiences to sow dissent among Russia’s neighbors and within the European Union — are taken as a matter of faith with almost no proofs adduced. Anyone who questions this “group think” is immediately labeled a “tool of Putin” or worse. 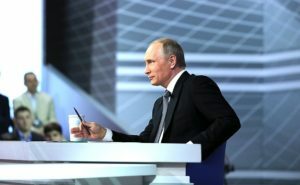 I experienced this firsthand in March 2015 when, as one of three debaters on “The Network,” a Euronews public affairs program, I objected to remarks by a fellow panelist, Chairman of the European Parliament’s Foreign Relations Committee Elmar Brok, who maintained that Putin crushed all liberties and his country has no free press. Based on my familiarity with the many different political lines of the Russian print media and of the patently unintimidated Kremlin-critics behind the national radio station Ekho Moskvy and television station Dozhd’, I countered that, for example, Russian coverage of events in the Donbass was more multi-sided and free than coverage in the U.S.
Brok lashed out with the slanderous question: “And how much did the Kremlin pay you to say that?” The broadcaster then allowed this video-taped exchange to air freely. I have ruminated on this exchange ever since and sought incontrovertible proof of the relative freedom of expression on Russian broadcast media. My close examination of the wildly popular political talk shows on Russian television first as a spectator and then as a participant has provided just that. I have written previously about my initial experience going back six months to when I first took part in a program on the Rossiya 1/Vesti 24 state channel, Yevgeni Popov’s “Special Correspondent.” I mentioned at the time the nearly permanent presence on these programs of domestic opposition figures as well as of foreigners from the U.S., Ukraine, Poland and Israel, in particular, who could be counted on to present views on the political topic of the day’s discussion at sharp variance with the Kremlin line. In early autumn I appeared on the same presenter’s new show “Sixty Minutes,” as well on what is probably the most respected show of this genre, “Sunday Evening with Vladimir Soloviev,” another Rossiya 1 production. Soloviev has done feature-length television interviews with Vladimir Putin and may be considered to be as close to power as people in this medium get. His personal views are probably more nationalist than the ruling United Russia party, but on his shows he, too, gives time on air to very diverse Russian and foreign views. In the past month, I broadened my experience with the Russian talk show format by participating in shows on the other major state channel, Pervy Kanal (“Time Will Tell”) and on the country’s largest commercial television channel, NTV (“The Meeting Place”). This accelerated learning was facilitated by the U.S. presidential elections, which made Russian-speaking talking heads from America like myself a rather hot commodity on Russian television at least briefly. In speaking to fellow panelists during break time, in interviews with presenters, I gathered some inside information about the production side of the talk shows, including their target audiences, their technical aspects and their substantive positioning. Anyone looking over Russian television programming in general quickly finds that talk shows as a format take up a very large part of broadcast time. Of course, the focus of talk shows may be highly diverse, and political talk shows were traditionally an evening phenomenon, as is the case with the Rossiya 1 shows cited above, while daytime programming more typically focuses on housewives’ concerns, daydreams of romance or tips for cooking, and the like. In this sense, it was a bold move when two years ago Pervy Kanal decided to launch a daily two-hour political talk show (“Time Will Tell”) in mid-afternoon. As expected, the target audience proved to be stay-at-home women and viewers aged 50 and above, although it appears there are also a fair number of viewers watching the program in the work place. The ratings captured by this show typically are in the 20s, meaning that 20 or so percent of all television viewers in Russia at the given time are tuned to the given program, yielding an audience numbering in the millions. On Nov. 9, when I appeared on the show dedicated to analysis of the U.S. election results, the numbers spiked to 30 percent, as one might well understand given the very great interest among ordinary Russians in the outcome of the race for the U.S. presidency and the outlook for war or peace. As “Time Will Tell” presenter Artyom Sheinin explained to me, the decision to appear on daytime television called for certain production decisions differentiating the programs from the evening talk shows. Firstly, the expectation of a less sophisticated audience meant that the language of panelists should be free of political science jargon and allusion to little known names or philosophies. Said Artyom, panelists are asked to pitch their arguments as they would “talking to their kids, their mom or their lover.’’ On the other hand, overly calm discussion is not seen as a benefit. The presenter explains that his audience sitting at home at mid-day is in need of “an adrenaline shot,” and the normal penchant of Russian panelists to shout down one another in a free-for-all is not discouraged in the way it is on evening programming. The evening viewer is assumed to have come home from work and is seated in his armchair before the television, wants his nerves soothed more than excited. 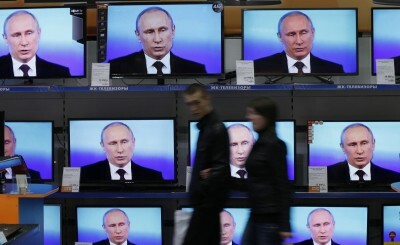 All Russian political talk shows on the main channels are produced in the afternoon, Moscow time, and all feature on screen the caption “Live On Air.” However, where and when these shows are broadcast live versus rebroadcast from video tapes is another matter. 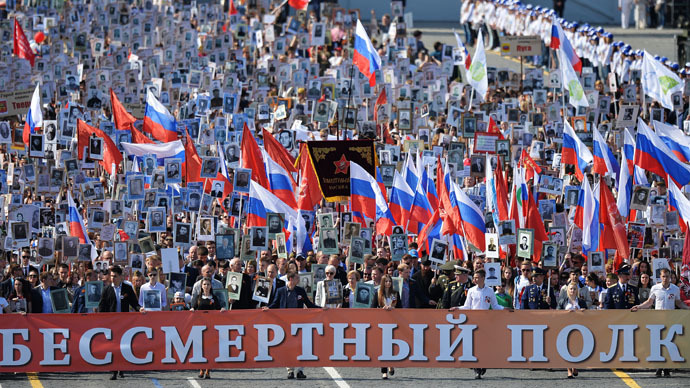 For example, the Rossiya 1/Vesti programs are broadcast live to the Russian Far East, where they appear at the end of prime-time evening broadcasts. Then they are re-broadcast at local evening prime time in each of the eight other time zones of the Russian Federation lying to the west, showing last in Moscow. In this regard, two years ago when it launched “Time Will Tell,” Pervy Kanal took a second unparalleled risk by broadcasting live to Moscow in the afternoon. From a political standpoint, this was like a high-flying trapeze act without the benefit of a safety net. In fact all of these programs are also video-taped, and all the major channels make the tapes available for internet viewing on their websites in full or shortened versions. Just as Russian television has often copied studio design and presentation formats from American television (I think in particular of the way the “Tonight Show” has been replicated on major Russian channels), so they copy from one another. In fact, if you turn on any of the political talk shows I cited above, you will find rather similar studios with live audiences. Indeed, at Pervy Kanal, the producers remark jokingly that when NTV decided to launch its own afternoon talk show, “The Meeting Place,” that network picked up not only the production format and studio design but also some of the production staff. The format of having male-female pairs of talk show hosts also has spread widely in the industry. But there appears to be a significant difference between these shows on the degree to which they are “scripted” by management upstairs, the degree to which they are free discussion. Perhaps the most scripted is this season’s new entry at Rossiya 1, “Sixty Minutes,” in which presenters Yevgeni Popov and Olga Skabeyeva are reading off teleprompters and the audience applause is aggressively prompted. On the other hand, the lead presenter on Pervy Kanal’s “Time Will Tell,” Artyom Sheinin proudly says that he has no script handed to him, that what he says on air is what he himself prepared or is thinking at the time. One ubiquitous fact is that the panelists are not scripted and if anyone is cut off in mid-sentence it is by other panelists vying for the microphone, not by the presenter keeping the political line of discourse in check. Except in the case of senior politicians, who are given the respect their rank demands, no panelist is safe from interruptions and the audience encourages a culture of gladiators in the arena, with applause punctuating the debates. On NTV there is the additional expression of audience disapproval, but that is rare. The benefits of these ground rules go to the quick-witted as well as to the loudest voices, whatever their political complexion. The culture of these talk shows is permeated by a newsroom mentality. Some of the presenters, especially on Rossiya 1/Vesti 24, come from television journalism and have gotten their appointments as a reward for successful work in the field, especially in hazardous areas. Such was the background of talk show host Yevgeni Popov, who for years reported from Ukraine, initially during the Orange Revolution days and later during the Maidan protests. The content of each program on all channels is subject to change at the last minute as are the list of invited panelists in case of breaking news. This favors inviting panelists who are living in the Moscow area. They can be invited and disinvited at short notice. In fact, all the major political shows on the three channels I observed from inside use many of the same Russian and foreign panelists chosen from among political scientists at universities or think tanks, journalists and Duma or Federation Council members. To be sure, not all panelists come down to the studio. A very few lucky experts are given air time from remote locations, their close-up image projected onto a wall-sized screen. One such “regular” on the Rossiya 1/Vesti 24 channel is Dimitri Simes, president of The Center for the National Interest in Washington, D.C. These vignette appearances get special treatment, without any interruption from other panelists and only respectful questioning from the host. Panelists in greatest demand can be seen leaving one show early so as to be able to get over to another studio on a different channel when there is the rotation of panelists between advertising breaks. None is in greater demand than the American Michael Bohm, who in the dark days of worsening relations with the West provided all channels with highly fluent statements in Russian of the latest policy position of the Washington Consensus, often accompanied by Russian folk expressions. 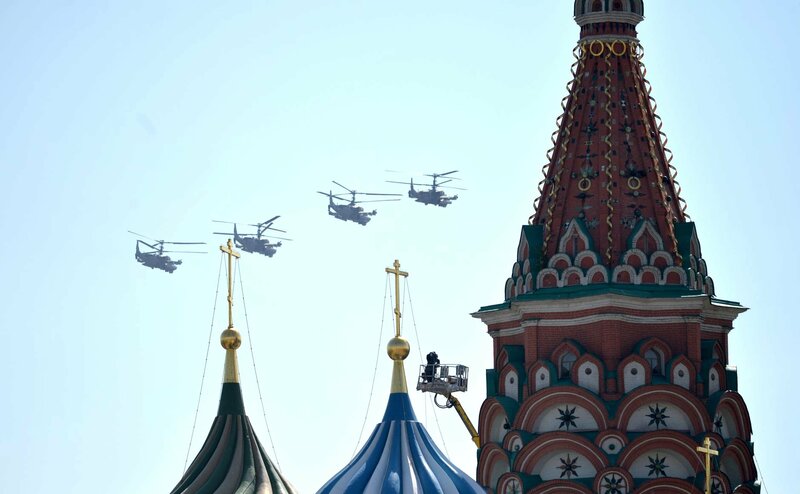 This has been especially appreciated by television producers representing the more hardline supporters of the Kremlin for whom Bohm is the kind of American the audience loves to hate, his every remark justifying demands for greater military expenditures by the Kremlin. Nonetheless, it remains true that through Bohm and a few other Westerners on these shows, the full blast of Western critiques of Kremlin policy gets prime broadcasting time in Russia. The senior politicians brought in as panelists come from all the Duma parties, not just the ruling United Russia. In the past half year, I noted in particular the frequent presence of the leader of the nationalist LDPR party, Vladimir Zhirinovsky, while Gennady Zyuganov of the Communists or Sergey Mironov, leader of Just Russia, have been rare birds. On the other hand, there have been frequent appearances by the Liberals of the Yabloko party, which never made it past 1 percent of votes cast in the latest parliamentary elections, not to mention the minimum 5 percent threshold for Duma representation. The talk show programs are prepared with great professionalism. Behind each there is extensive research to find appropriate archival and/or latest visuals. The administrative chores involved in arranging logistics for the panelists chosen are also considerable. The team members I have encountered were uniformly dedicated, working crazy hours to get their job done. I also noted a peculiar complicity between the staff “handlers” and us panelists. Clearly, production staff is rewarded for finding “fresh blood” panelists who play out well, and they make sure that their dogs in the race are well tended with coffee, tea, and, if needed, a shot of brandy during breaks to keep their spirits high. On the Rossiya 1/Vesti 24 talk shows presenters and the panelists all are wired with headset microphones. However, on both Pervy Kanal and NTV, only the presenters are wired, while panelists are seated next to production assistants holding microphones, which they make available upon request. Indeed, the assistants act as coaches to newcomers like myself, whom they urge to speak louder, speak faster, etc. to get the greatest debate effect out of us. In conclusion, my firsthand experience with the Russian political talk show phenomenon left me with no doubt that this is bona fide journalism serving the public interest, exposing the broad Russian television audience, from everyone’s parents and grandparents to business leaders and university dons, to a great many different competing and well-presented views on the major issues of the day, both domestic and international. This reality is sharply at variance with what U.S. and Western European mainstream media would have us believe about Putin’s Russia. 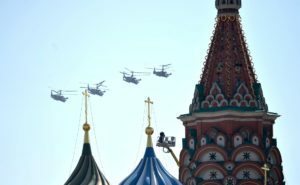 Gilbert Doctorow is the European Coordinator of The American Committee for East West Accord Ltd. His most recent book, Does Russia Have a Future? was published in August 2015.